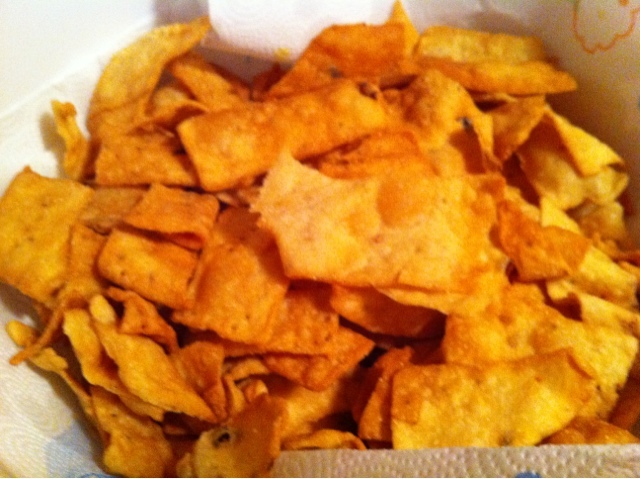 This is the first time I made this yummy and crispy snacks. My mother used to make them and serve hot when we return from our school. We used to munch on them, I enjoy eating them with little fresh and finely chopped tomatoes and onion seasoned with salt and pepper. They are just like mexican Nachos with Indian flavor. This is a simple yet delicious recipe. If you are looking for an instant Indian spicy and crispy evening tea time snack this should be perfect for you! This can be made during festivals too!!! It is a long term storage snack, it will stay good for 15days or more if you store in air tight container. Mix all the ingredients together with little water. The consistency of the dough should be like chapati/roti dough. Once the dough is ready take 2tbsp of oil and spread it on the surface of the dough. This way the dough remains moist. Keep it aside by covering with lid for about 10min. Now separate the dough in to 8 equal parts and roll like roti (Medium thin) cut it with a knife into diamond shaped pieces. Fry them in oil under medium flame. Flip them and cook on other side. Do not fry them under high flame, by which outer surface will be burned and inner remains raw. The biscuits will become tasteless and soft. Hope you like my recipe!!!! please like on facebook if you love this recipe!!! !